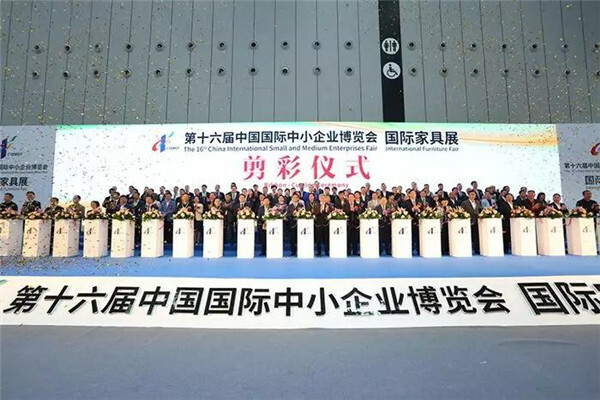 On March 17, 2019, the International Furniture Fair of the 16th China International Small and Medium Enterprises Fair was unveiled at Tanzhou International Convention and Exhibition Center. The theme of this exhibition was "New Home Scene, New Industry Ecology". There were five characteristic thematic pavilions, including Comprehensive Home Pavilion, International Home Pavilion, Design Customization Pavilion, Stair Rosewood Home Pavilion and Pan-Home Characteristic Pavilion. The exhibition covers about 50,000 square meters with 208 exhibitors. Cheers, Right, Suofeiya and other well-known domestic and foreign furniture brands and enterprises appeared, which showed advanced technology, design and service of pan-household industry chain, leading the new trend of pan-household consumption. Meanwhile, several activities were held such as the awarding of "Concave-convex Design Award", “Belt and Road Initiative” International Home Furnishing Industry Cooperation Forum & Business Association Conference, the 4th China Home Furnishing Elites Association, National Dealer Training Conference, and the Spring Home Exhibition & Purchase Fair. The combination of static exhibition and real-life experience at the exhibition site attracted professional buyers from all over the world, providing a platform for pan-household industry to exhibit, trade, exchange and cooperate. The exhibition pioneered in cross-border fusion scenes experience, gathered international bonsai, flowers, elegant stones and other collections, and brought an extraordinary industry art customized tour. "Home life + family service" help people have a better life. Thematic activities covered design, marketing, international cooperation and other fields. The "Concave-convex Design Award" set a new rule of tutorial competition system. Design innovation platforms, famous design masters, industry organizations, design colleges and leading enterprises from China, Britain, Germany, France, the United States, Italy and other countries as well as from regions like Hong Kong, Macao and Taiwan of China jointly advocated respecting intellectual property rights and stimulating "original power" of design industry to promote healthy development. On the occasion of World Sleep Day on March 21, more than 50 well-known domestic brands of sleep science and technology enterprises released 2019 new products, advocating healthy sleep and leading a new life of healthy home. Unbioth Company joined hands with several Japanese-funded enterprises to create a full-range exhibition area for the aged household industry in Japan and made its first appearance in this exhibition, which opened a new area for the success of the household industry and created new development opportunities.